Recipe Contributed by Managing Editor K.Slye. I was perusing the Weston Supply website a few months back, trying to figure out what I wanted for Christmas, when I came across the Natural Hog Casings. 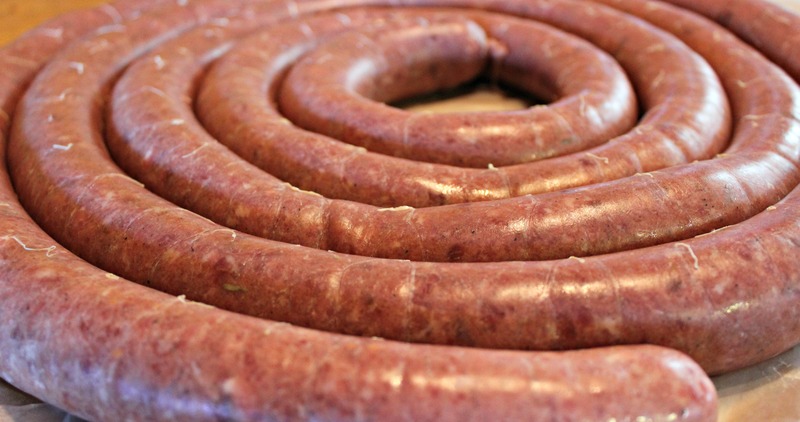 I’ve been wanting to make my own venison sausage links for a while, so I ordered a package of the casings, enough to make 25-30 pounds of sausage. When the deer season finally ended in Pennsylvania, my friend, Bryan, and I were able to find the time to have what we called a “sausage making party.” We each brought 4 to 5 pounds of venison and 6 to 8 pounds of locally butchered pork shoulder. We made three different types of sausages, a Pennsylvania maple syrup sausage, a breakfast sausage, and a summer sausage. 1.) Follow the directions on the package of casings to prepare them to be used. For Weston’s Natural Hog Casings they needed to be set in cold water to soak for about 40 minutes. 2.) Run the pork and venison through the grinder separately – using the largest grinding plate. 3.) Divide the pork and venison into the designated amounts that are needed for each recipe. 4.) Run the set portions of pork and venison together through the grinder using a smaller grinder plate to evenly mix it. 5.) Combine the seasonings for each recipe with the portion of meat venison/pork mixture, mix thoroughly and set each mixture in the refrigerator while preparing to stuff the casings. 6.) Clean the grinder and other components thoroughly. 7.) Thoroughly rinse out the inside of the casings with cold water. 8.) Put on the sausage stuffing attachments for your grinder and slide casing over sausage stuffing tube, put a small about of olive oil on the tube to help slide the casing on. 9.) Once the casing is on the tube, tie off the end. 10. )You are now ready to start stuffing the sausage. It is much easier with two people – one to feed the grinder and one to guide the sausage. The person guiding the sausage should put a small amount of olive oil on their fingers so the casing has less of a chance to rip during the stuffing process. 11.) As the first person feeds the grinder, the second person should guide the sausage being filled into the casing, dictating the amount that it is filling. 13.) If you want to make links, in the area you want to make a twist, slowly pinch the casing together and twist, when moving to the next link be sure to twist in the opposite direction. 14.) If not cooking right away put in the refrigerator for a day, this will help tighten up the casing and keep their shape. can i switch the amounts of venison and pork. example is in the maple syrup sausage 3lbs pork 2lbs venison can i make it with 3lbs venison and 2lbs pork or will there not be enough fat in it? Yes you should be able to switch for that amount. The sausage will be a little more dry as a result.